Meetings, conferences, and other important activity will always require projectors and speakers, especially in a workplace where videos and sound information are most needed. If you are using a projector during presentations, it is important to have an external speaker that can deliver excellent clarity for its audio. If you are hosting a large number of people in a large area, connecting speakers with numerous wires can be troublesome. Fortunately, there are now wireless external speakers that can help you eliminate messy wires and cables when connecting audio to a projector. Wireless speakers are now becoming a trendy thing because of their amazing sound quality and convenience. With external speakers, you can easily connect a projector without compromising the sound quality. The Logitech Surround Sound Speaker System is a powerful THX-certified speaker that can turn your room into an excellent home theater. With its amazing sound quality, you can almost an actual footstep, squeal, and rumble. Having this speaker system gives you a cinema-quality sound best for movies and concerts. With 500 watts of power, it has the ability to give up to 1000 watts in a certain condition. You can feel the room-shaking, thunderous, and deep bass. 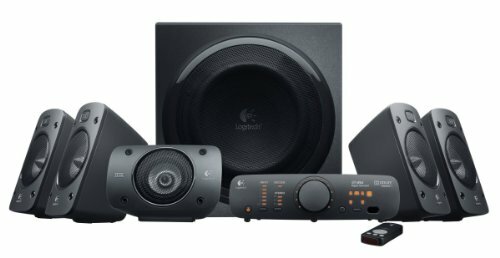 The Logitech Surround Sound Speaker System is also a versatile system as it can connect up to six different devices such as game console, TV, music player, computer, and more. It comes with a wireless remote that lets you control and personalize your sound experience. You can control the volume, mute, power, and other inputs from the remote into the console. With Dolby Digital and DTS encoding feature, you can accurately hear great sound mix in your game soundtracks or even Blu-ray DVD. You can mount this surround speaker system or place it on a shelf to customize the seating area of your entertainment room. Lastly, the Logitech Surround Sound Speaker System has a Z906 speaker that converts two-channel stereo from old movies, games, and music into an immersive and powerful sound experience. The Onkyo Dolby Atmos Home Theater System is a powerful surround speaker system package that can amplify realistic and noise-free signal processing with its high-current power for dynamic speaker control. It gives off a rich, pure, and authentic sound best for home theater movies, music, games, sports, and concerts. It comes with a 2-way bass reflex on the right and left speaker that can accommodate full-range acoustic suspension with Dolby Atmos-enabled speakers. It gives a special bounce and discrete sound effects in your entertainment room or any listening area. Aside from the solid surround sound, its amazingly built speaker package gives off the latest object-based sound as the producers intended. The Onkyo Dolby Atmos Home Theater System HT-S7800 brings the sound to speakers via a connection from the receiver into a second room. This Multi-Zone feature allows the owner to send internet audio and digital sources from coax or optical such as Apple TV into the second listening zone. With Dolby Atmos, you can experience 3D sound which lets you feel you are inside the action. It can transport ordinary sound into extraordinary. The Onkyo Dolby Atmos Home Theater System is also DTS:X-ready which means it has an object-based sound feature including height channels that gives a flexible and interactivity listening experience. Lastly, the Onkyo Dolby Atmos Home Theater System’s HDMI feature also supports the latest formats being released by Hollywood which includes 4:4:4 color space and 4K Ultra HD Video Performance. 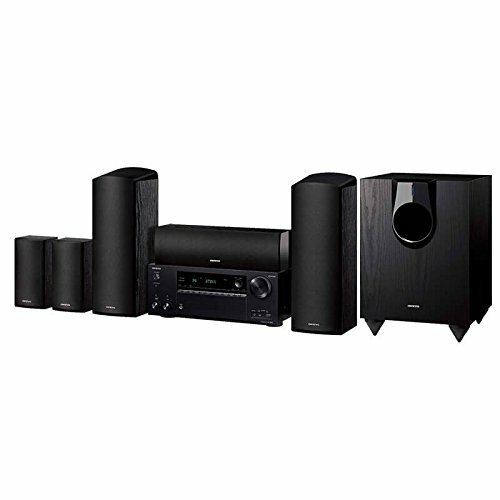 The Onkyo SKS-HT540 Home Theater Speaker System is an eight-piece speaker system perfect for home theater and DVD player receiver. This speaker gives amazing connectivity with your entire sound system and with your projector. It provides excellent clarity of sound which is very important especially when you are using a project for meetings and other work activity requiring projection displays. It has a 2-way bass reflex on the front and center. The speakers give an outstanding sound with 130 watts of output and room-shaking 230 watts’ power for rumbling impact, allowing you to feel real-life action through excellent listening experience. Each of the speakers has 5-inch woofers with original OMF diaphragm technology wherein they use cotton cones for a very extraordinary and extremely accurate sound response. The speaker system is designed to be minimalist. The complete package looks simple yet elegant. The speakers and woofers have a black finish which gives a techy and sophisticated look. This speaker allows you to connect the projector via Bluetooth. You may also use regular mono jacks or HDMI to seamlessly connect multiple devices. The strong quality and ease of use feature of the Onkyo SKS-HT540 Home Theater Speaker System make it an excellent choice when it comes to external speakers. With its superb structure and amazing sound quality, it can guarantee you a full and extraordinary listening experience. The Onkyo SKS-HT540 Home Theater Speaker System is considered as one of the best speakers for projectors in the market today. If you want to buy a wireless speaker for your projectors, you will need to consider different factors. But with a number of great options in the market, there will surely be one that will fit your preference. These speakers will help you to lessen the stress over unnecessary cables, in the case of wireless speakers. If you have limited space or area, you may want to consider wireless speakers for a projector that can also deliver excellent sound quality at the same time. These three speakers mentioned above will definitely be on the top of your list.